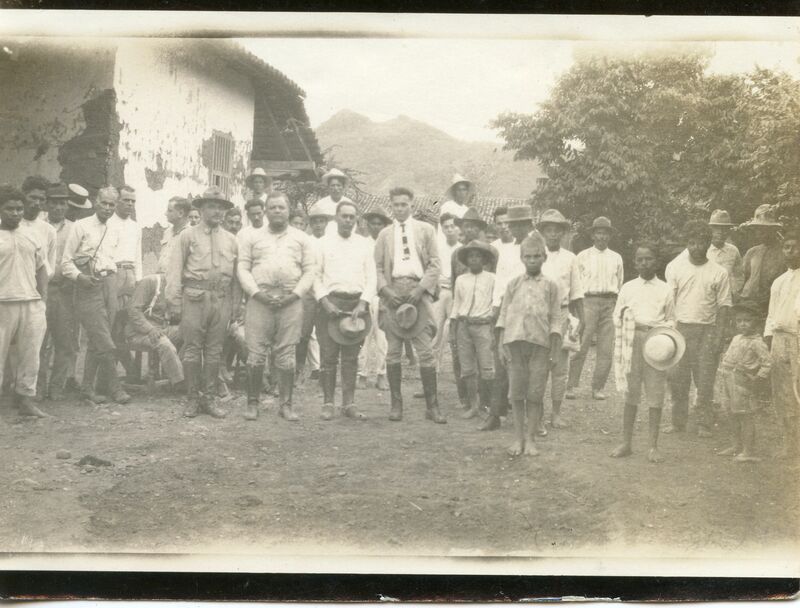 THIS FIRST PAGE of the MCRC Photograph Collection features the first 15 of 70 photos of Nicaragua from the collection of Captain George F. Stockes, housed here on the first five MCRC Photos pages. 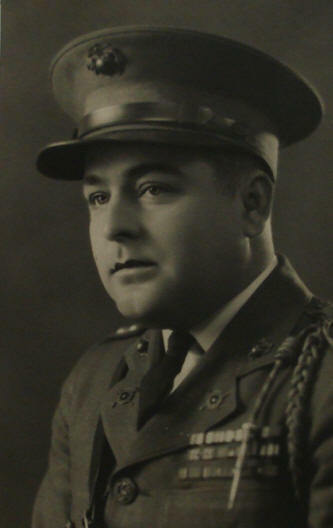 Captain George F. Stockes was one of the most capable and savvy Marine Corps officers to operate in Las Segovias during the period of US military intervention. A veteran of the Great War in France, Capt. 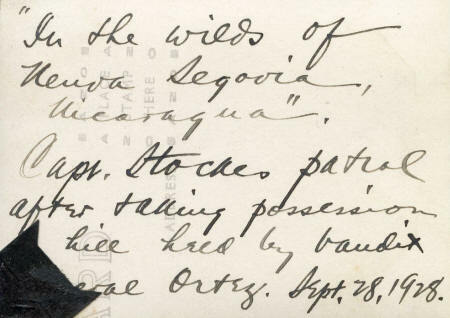 Stockes was stationed in Somoto from around August 1927 to April 1929. 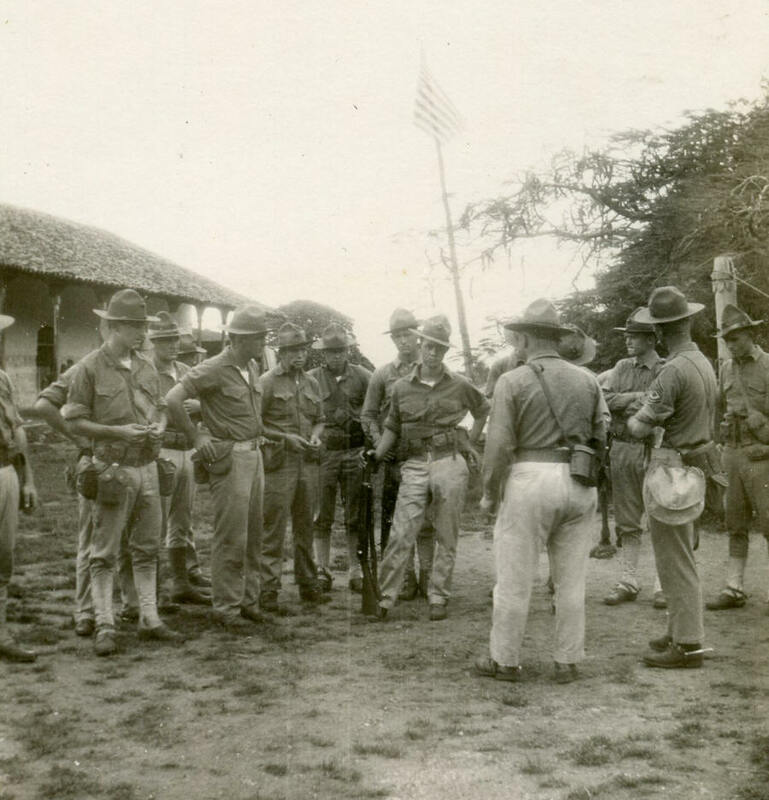 On his efforts to hunt down Sandinista General Carlos Salgado & other rebel chieftains in the Honduran borderlands in March-April 1929, see the TOP 100, PAGE 33; on his savvy biography of EDSN Gen. José León Díaz, see TOP 100, PAGE 44. The Stockes photographs appear in what seems to be random sequence in folder 7 of archival box 1 of the Stockes Collection in the Archives & Special Collections Room of the Marine Corps Research Center; here they are clustered by general theme. Most have no identifying captions; a few have writing on the back. When they do the writing is also shown. 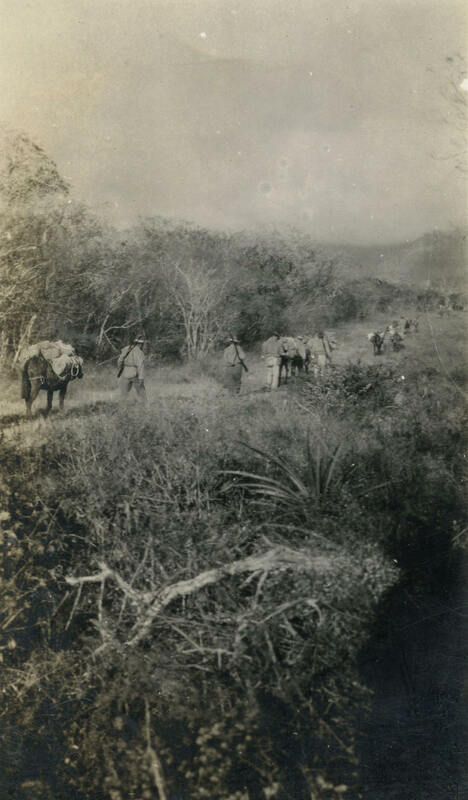 The Stockes photos are especially revealing for their depiction of the rural landscape in the Honduran border region of the Western Segovias; of the Voluntarios (with whom Stockes operated during the first half of 1929); and of Marines on patrol. (Right: Captain George F. Stockes). Click on the thumbnails on the right side of the photo banners for full-size, high-resolution copies of the photos on the page. I thank the staff of the Marine Corps Research Center in Quantico, VA for their kind assistance in digitizing these photos. 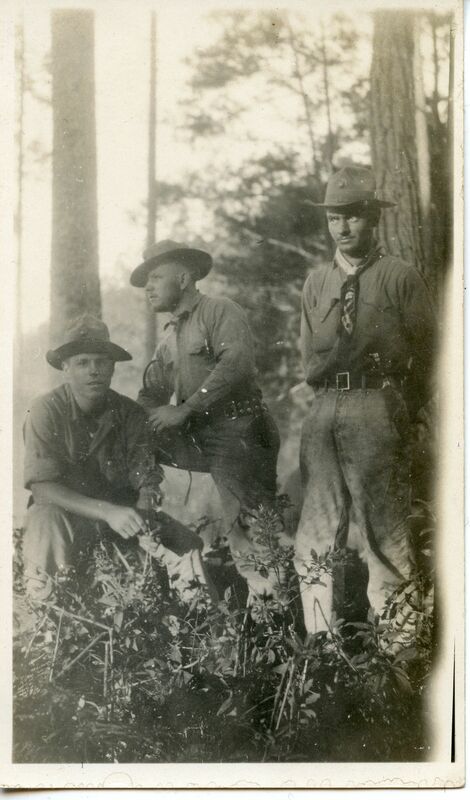 Grateful appreciation is also extended to Lebanon Valley College student researchers Olivia Edwards, Morgan Yealey, and Nikki Wilhelm for their help in digitizing these photographs. Photo MCRC-1.1. 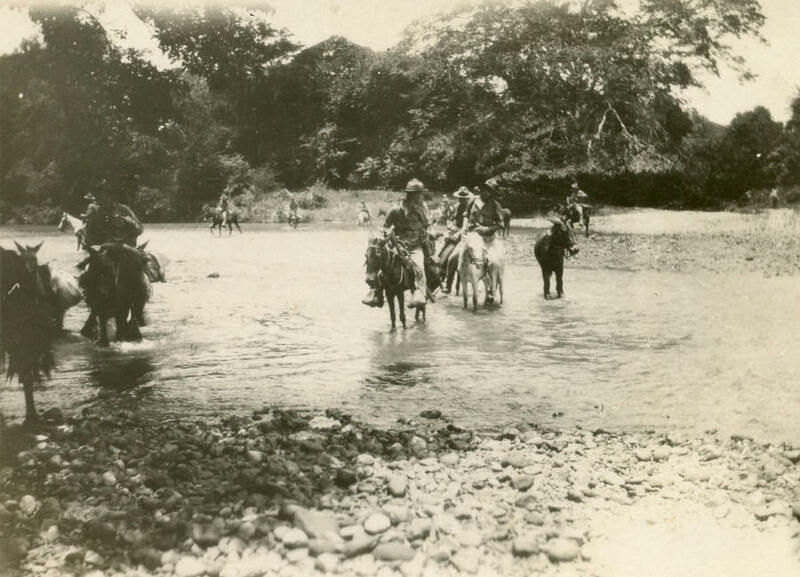 Marine patrol crossing stream near Somoto. Caption reads: "Crossing stream in the 'Heart of the Segovias'. Captain Stockes patrol from Somoto. 1st Lts. 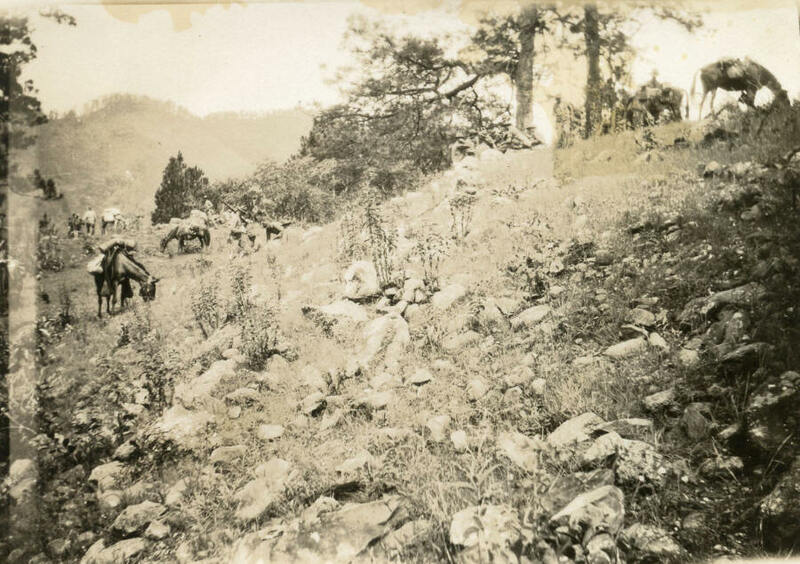 McHenry & Shaw with patrol from P. Nuevo [Pueblo Nuevo]"
Photo MCRC-1.2. 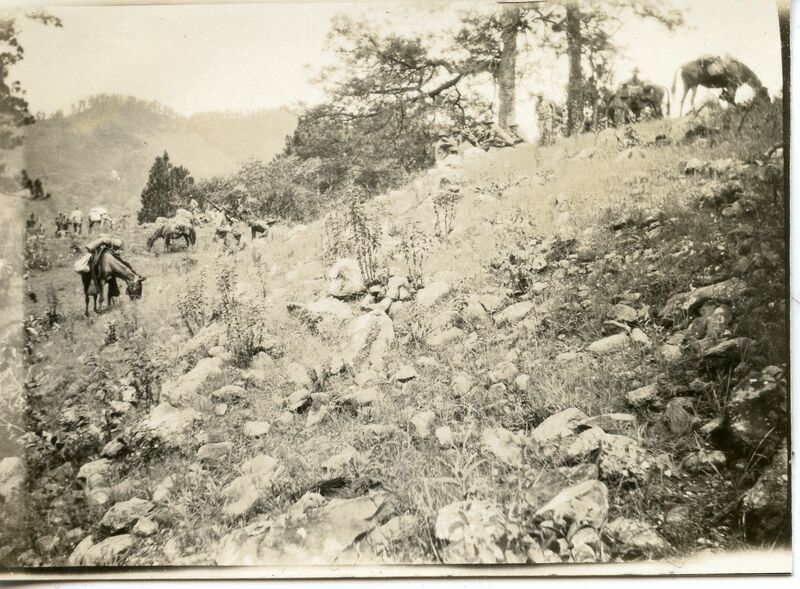 Patrol on Hillside near Somoto, 28 Sept. 1928. 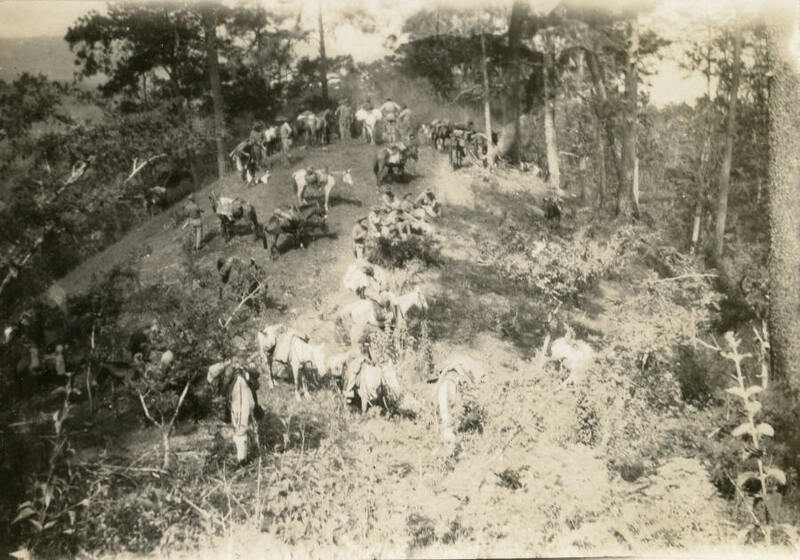 Caption on rear reads: "'In the wilds of Nueva Segovia, Nicaragua.' Capt. 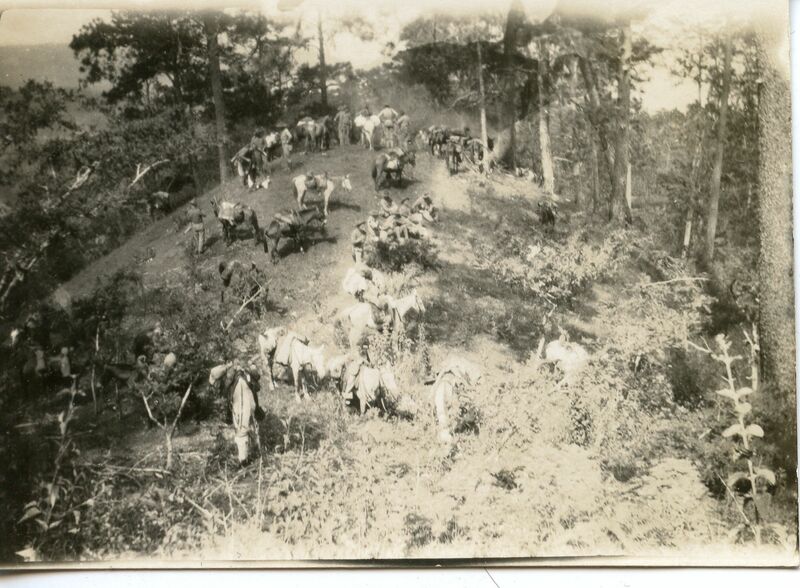 Stockes patrol after taking possession [of] hill held by bandit [General Miguel Angel] Ortez. 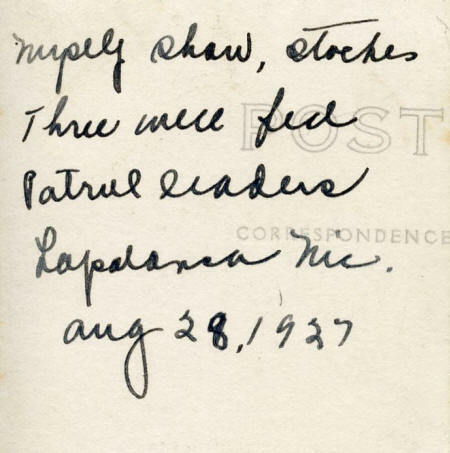 Sept. 28, 1928". Photo MCRC-1.3. 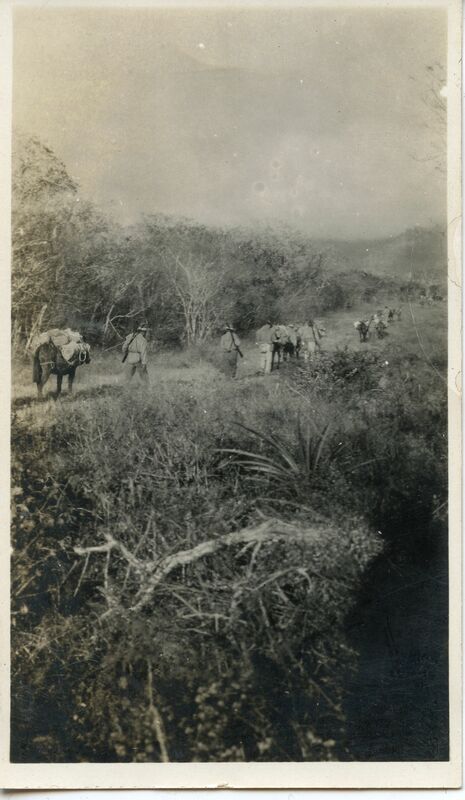 Patrol near La Palanca, Nicaragua, 28 Sept. 1928. 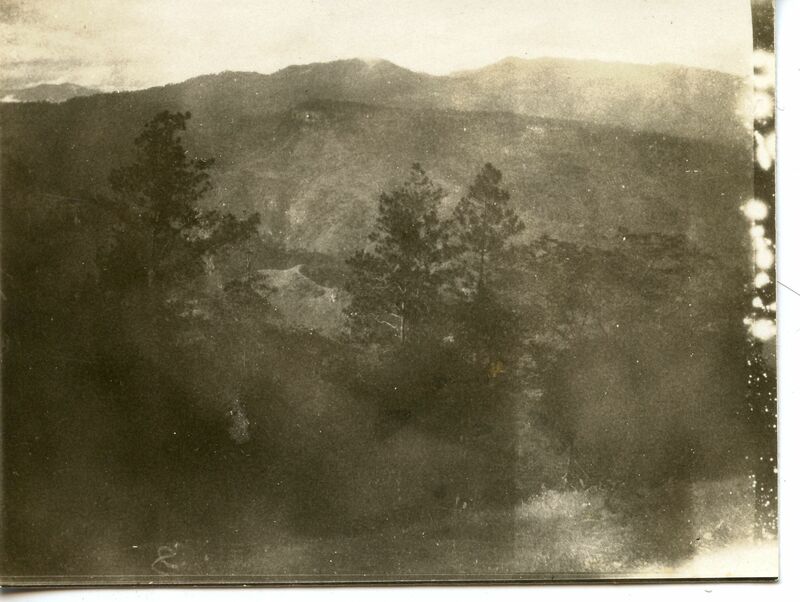 A second photo taken in the same context as the one above (MCRC-1.2). 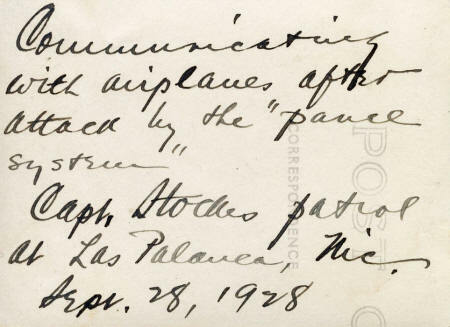 Caption on rear reads, "Communicating with airplanes after attack by the 'panel system'. Capt. 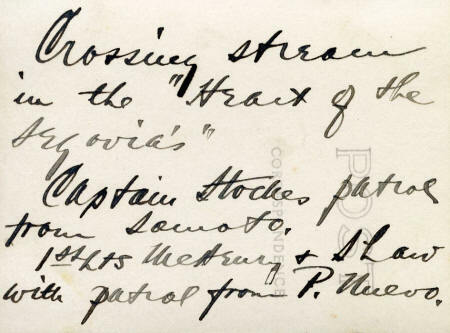 Stockes patrol at Las Palanca [sic], Nic. 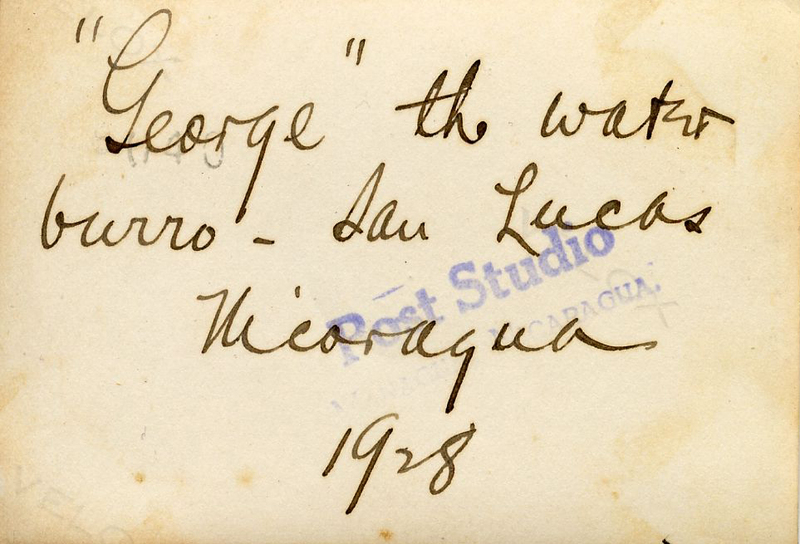 Sept. 28, 1928". Photo MCRC-1.4. Marines making camp at Mylote, Nic. near Honduran border. 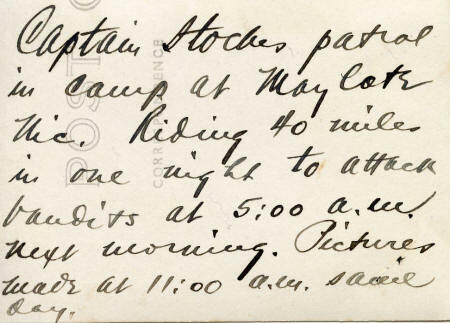 Caption on rear: "Captain Stockes patrol in camp at Maylote Nic. Riding 40 miles in one night to attack bandits at 5:00 a.m. next morning. Pictures made at 11:00 a.m. same day." Photo MCRC-1.5. 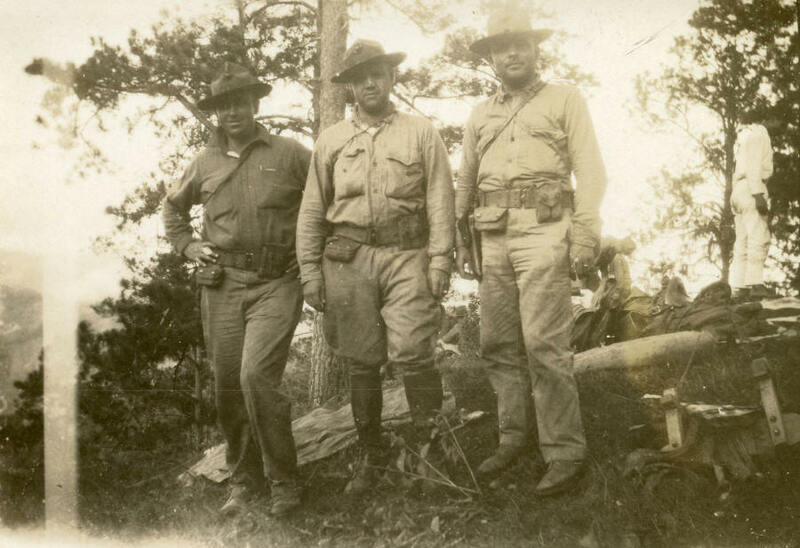 Three well-fed patrol leaders posing on hillside, including Capt. Stockes. Caption on rear: "[Nupely? ], Shaw, Stockes. Three well fed Patrol leaders Lapalanca Nic. aug 28, 1927." Photo MCRC-1.6. 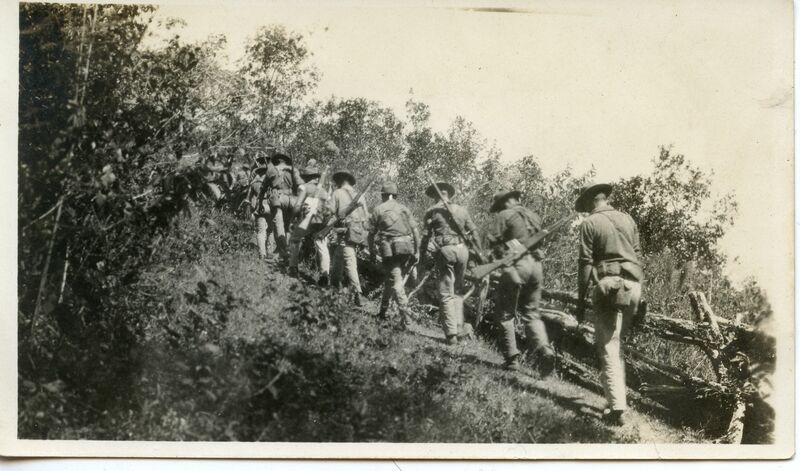 Marine patrol marching up hillside in the Western Segovias. 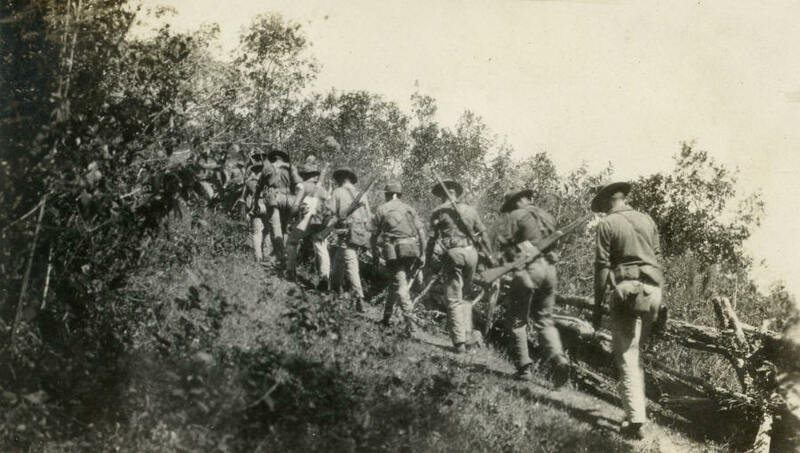 Marine patrol marching up hillside in the Western Segovias. No caption, no date. Photo MCRC-1.7. 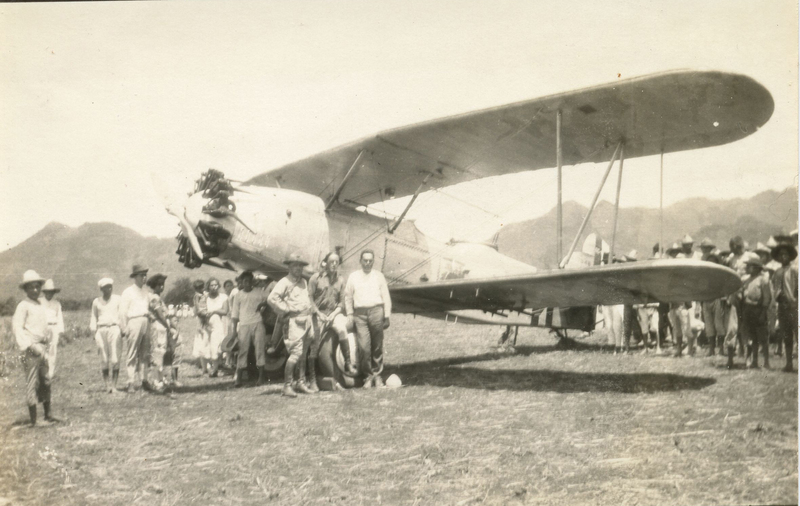 Marine Corps biplane parked on airfield. Marine Corps biplane parked on airfield, with Marines and civilians garthered around, including women and children. No caption, no date. Photo MCRC-1.8. 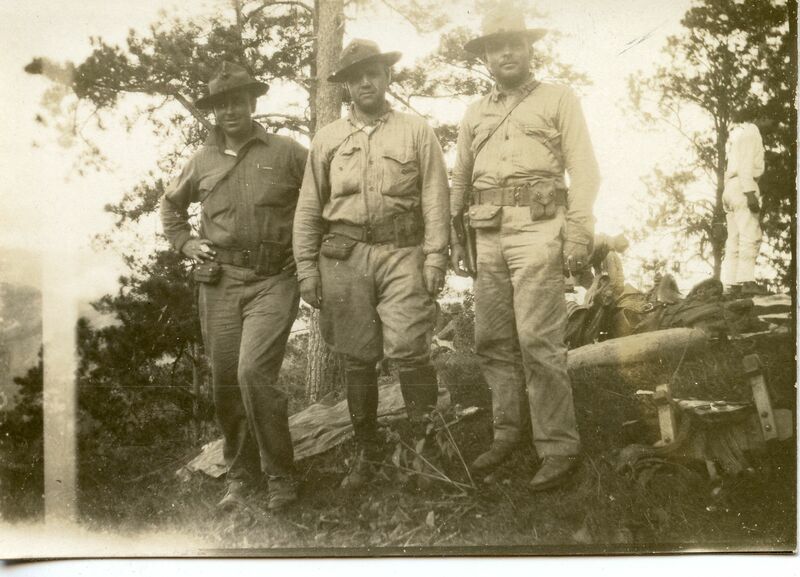 Three Marines posing by a tree. 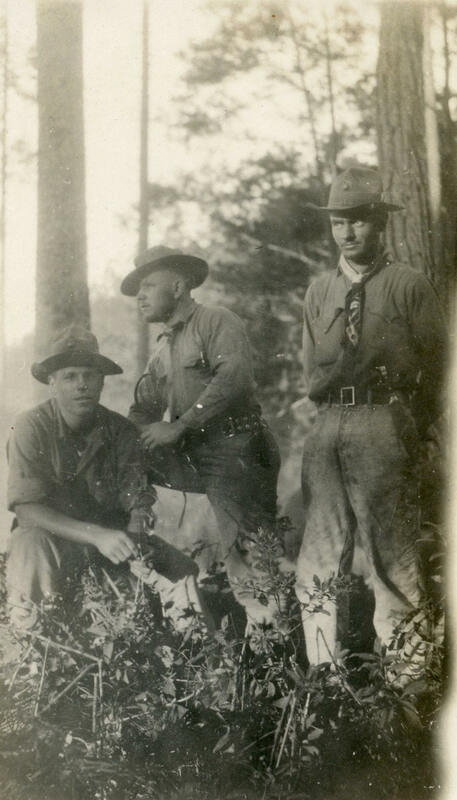 Three Marines posing by a tree in a wooded area. No caption, no date. Photo MCRC-1.9. 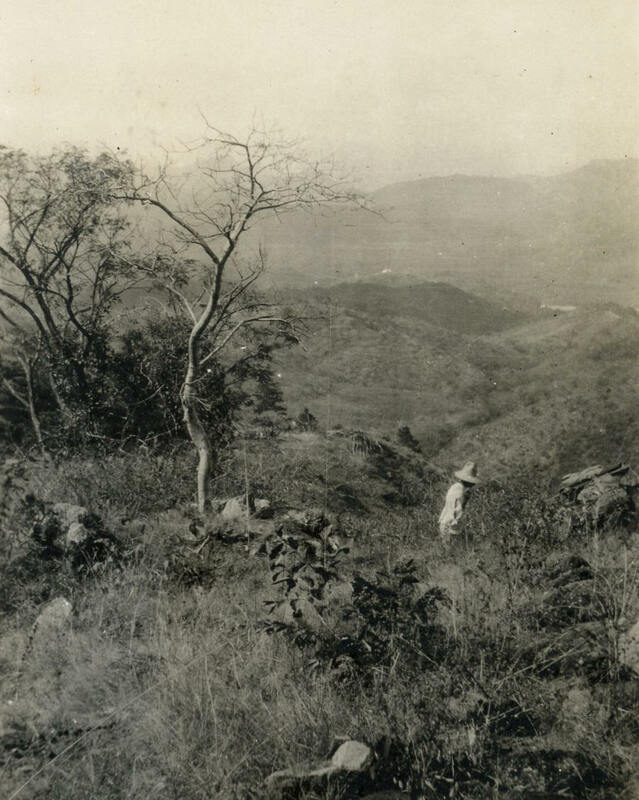 Campesino in a field overlooking valley. 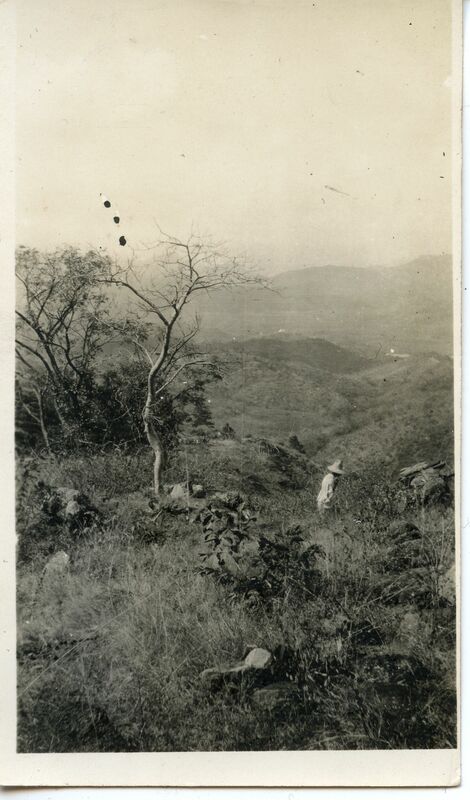 Campesino in a field overlooking a broad valley, perhaps Somoto. No caption, no date. Photo MCRC-1.10. Marines on patrol. Marines on patrol. No caption, no date. Photo MCRC-1.11. Capt. Stockes with gathering of Marines & civilians. Captain Stockes is the Marine officer at left in the front row. 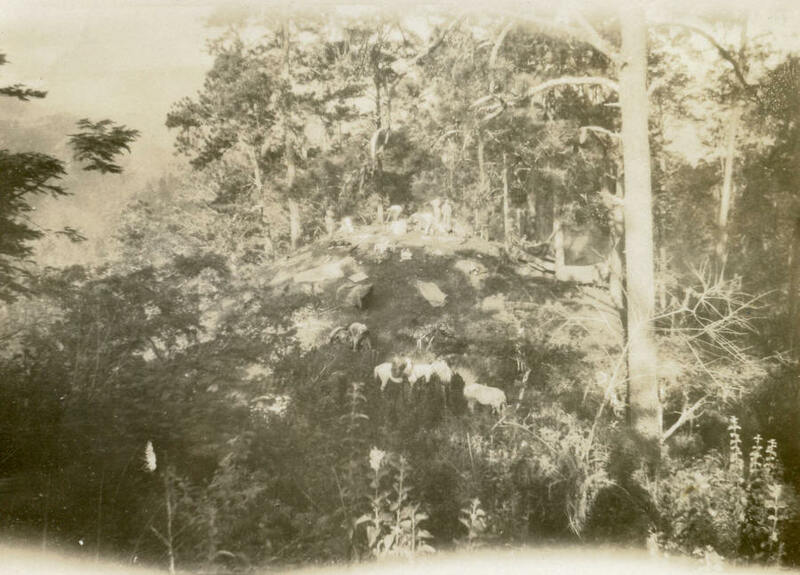 This appears to have been a gathering of local eminences (the three men in the front row, two holding their hats) and local inhabitants, perhaps in Somoto. Note the children's, and some of the adults' bare feet. No caption, no date. Photo MCRC-1.12. Marines conferring near their barracks. 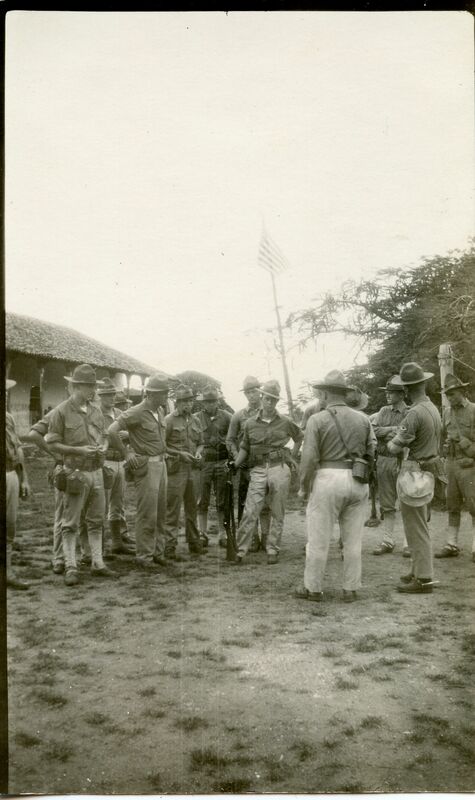 Marines conferring near their barracks (signified by flagpole and US flag in background), perhaps in Somoto. No caption, no date. Photo MCRC-1.13. 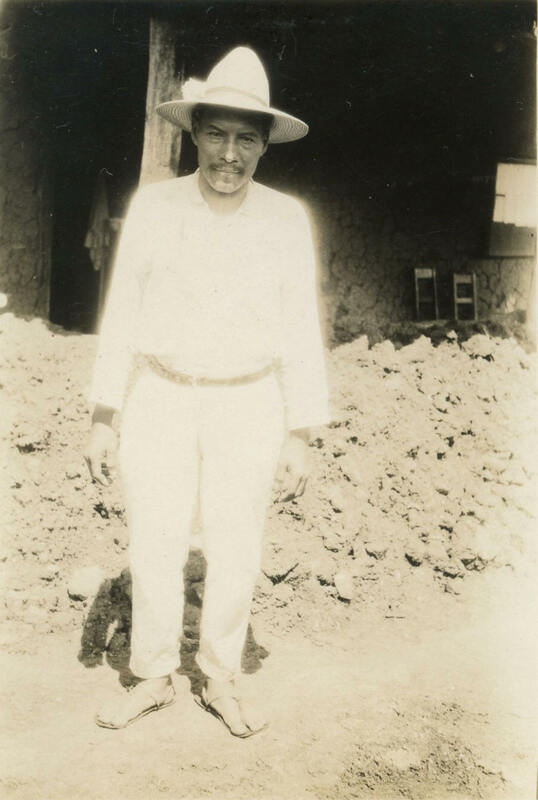 Native man dressed in white. 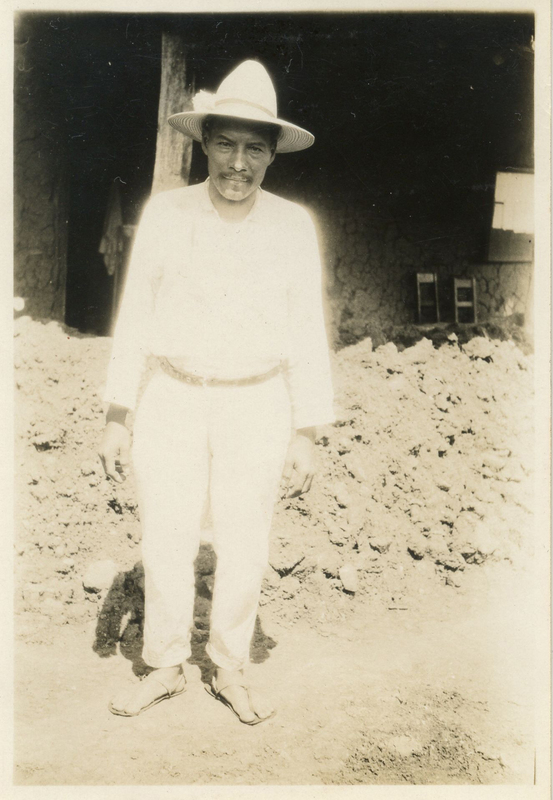 Native man dressed in white posing for photo. No caption, no date. Photo MCRC-1.14. 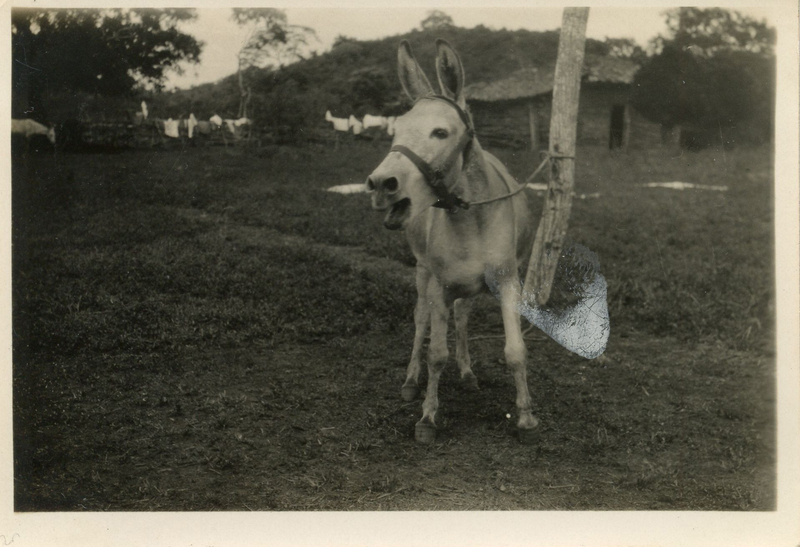 "George the water burro" tethered to a tree in San Lucas. 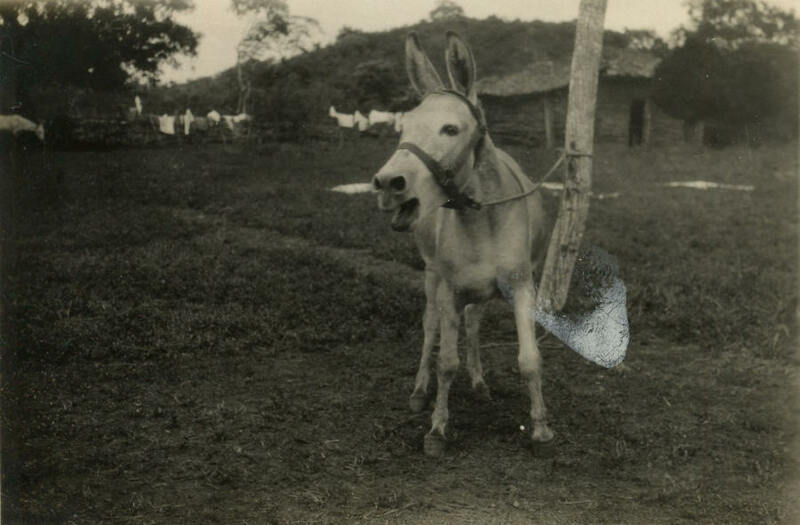 Caption on rear: "'George' the water burro - San Lucas Nicaragua 1928". Note the laundry drying in background. Photo MCRC-1.15. "The Land God Forgot". 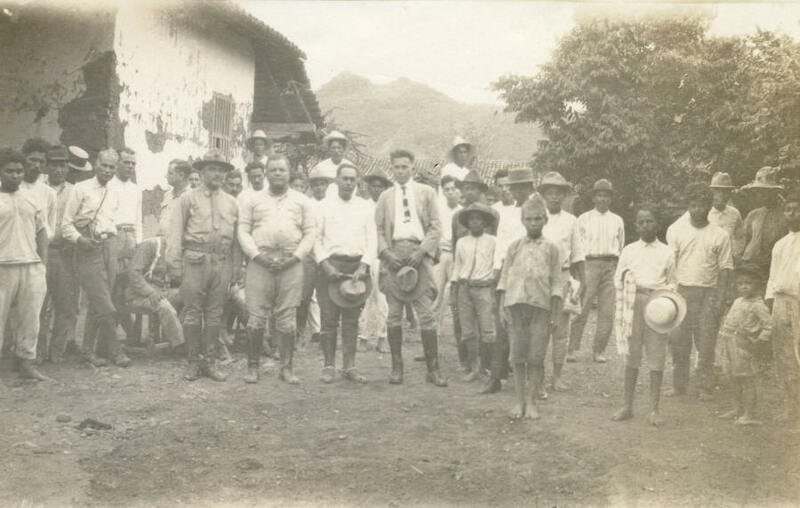 Mylote, Nicaragua, near Honduran border, Sept. 1928. 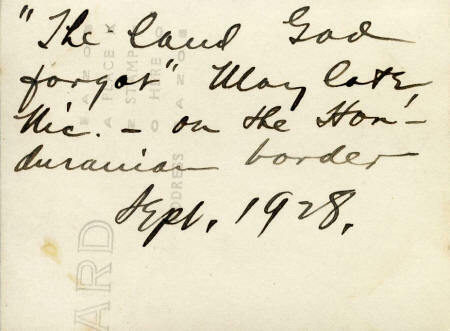 Caption on rear: "'The land God forgot' Maylote, Nic. - on the Honduranian border, Sept. 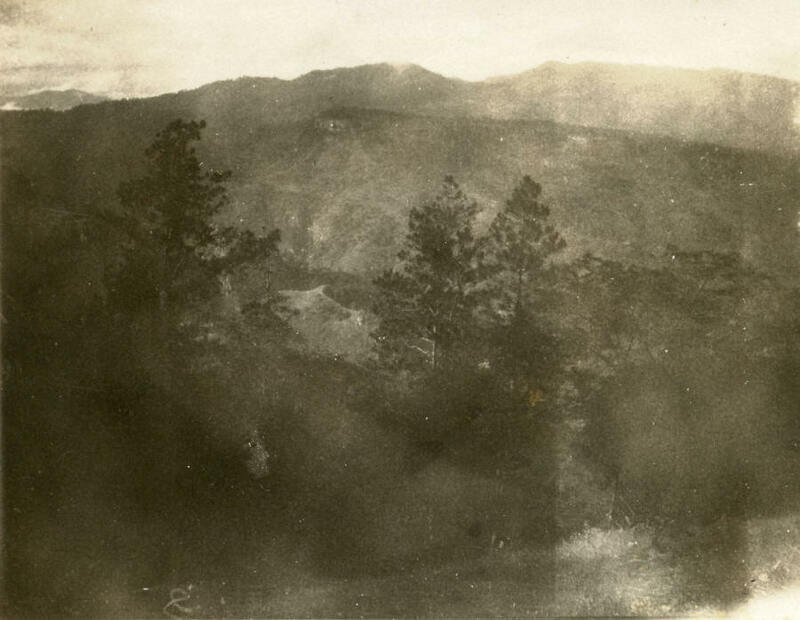 1928."